Ask RP Photonics for calculations of Brillouin scattering and for advice on how to suppress it. Brillouin scattering is an effect caused by the χ(3) nonlinearity of a medium, specifically by that part of the nonlinearity which is related to acoustic phonons . An incident photon can be converted into a scattered photon of slightly lower energy, usually propagating in the backward direction, and a phonon. The coupling of optical fields and acoustic waves occurs via electrostriction. The effect can occur spontaneously even at low optical powers, then reflecting the thermally generated phonon field. For higher optical powers, there can be a stimulated effect, where the optical fields substantially contribute to the phonon population. Above a certain threshold power of a light beam in a medium, stimulated Brillouin scattering can reflect most of the power of an incident beam. This process involves a strong nonlinear optical gain for the back-reflected wave: an originally weak counterpropagating wave at the suitable optical frequency can be strongly amplified. Here, the two counter-propagating waves generate a traveling refractive index grating; the higher the reflected power, the stronger the index grating and the higher the effective reflectance. In optical fibers, Brillouin scattering occurs essentially only in backward direction. However, rather weak forward Brillouin scattering is also possible due to effects of the acoustic waveguide. The Brillouin frequency shift depends on the material composition and to some extent the temperature and pressure of the medium. Such dependencies are exploited for fiber-optic sensors. Another important application of stimulated Brillouin scattering is optical phase conjugation. There are for example phase-conjugate mirrors for high-power Q-switched lasers which make it possible that the thermal distortions occurring in forward and backward direction in the laser crystal compensate each other. Stimulated Brillouin scattering (SBS) is frequently encountered when narrow-band optical signals (e.g. from a single-frequency laser) are amplified in a fiber amplifier, or just propagated through a passive fiber. While the material nonlinearity of e.g. silica is actually not very high, the typically small effective mode area and long propagation length strongly favor nonlinear effects. 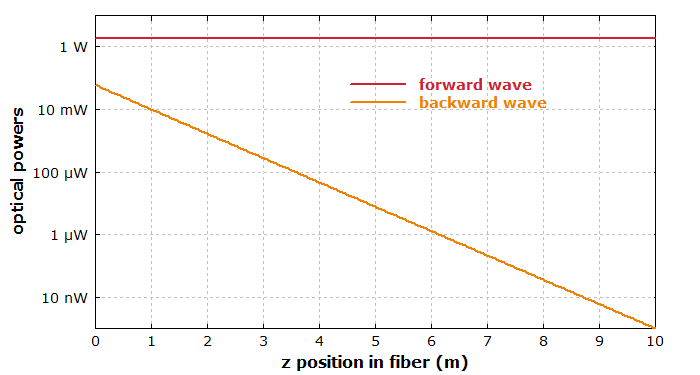 Figure 1 shows what happens when a monochromatic light wave is injected into a 10 m long fiber. The counterpropagating Brillouin-shifted wave starts from quantum fluctuations with a very low optical power, but grows rapidly. 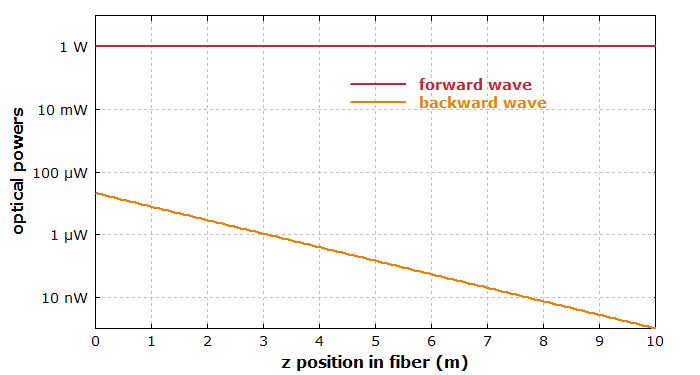 Still, it stays far smaller than the input power of 1 W.
Figure 1: Pump power (propagating from left to right, red curve) and resulting Brillouin signal power (right to left, orange curve) in a 10 m long fiber. The pump input power is 1 W.
For a somewhat increased pump power of 1.8 W, the Brillouin gain (as measured in decibels) is nearly doubled, and the Brillouin wave becomes far stronger. Figure 2: Same as Figure 1, but with 1.8 W pump power. For a further increased pump power, the power of the Brillouin wave would become comparable to the pump power. In that case, substantial pump depletion occurs. For high SBS gain, that does not lead to a stable situation, but to chaotic fluctuations of the powers. If the fiber is many kilometers long, milliwatt powers can be sufficient to cause substantial Brillouin scattering. However, one then has to take into account propagation losses, which are substantial of such fiber lengths. The affect both the pump wave and the Brillouin wave. For silica fibers, the Brillouin frequency shift is of the order of 10–20 GHz, and the Brillouin gain has an intrinsic bandwidth of typically 50–100 MHz, which is determined by the strong acoustic absorption (short phonon lifetime of the order of 10 ns). However, the Brillouin gain spectrum may be strongly “smeared out” by various effects, such as transverse variations of the acoustic phase velocity [14, 19] or longitudinal temperature variations [11, 13]. Accordingly, the peak gain may be strongly reduced, leading to a substantially higher SBS threshold. The Brillouin threshold of optical fibers for narrow-band continuous-wave light typically corresponds to a Brillouin gain of the order of 90 dB. (With additional laser gain in an active fiber, the threshold can be lower.) For trains of ultrashort pulses, the SBS threshold is determined not by a peak power, but rather by a power spectral density, as explained in a Spotlight article. SBS introduces the most stringent power limit for the amplification and the passive propagation of narrow-band optical signals in fibers. In order to raise the Brillouin threshold, it is possible to increase the bandwidth of the light beyond the Brillouin gain bandwidth, reduce the fiber length, concatenate fibers with slightly different Brillouin shift, or (in high-power active fiber devices) exploit the longitudinally varying temperature . There are also attempts to reduce the overlap of guided optical and acoustic waves, or to introduce significant propagation losses for the acoustic wave. To some extent, SBS problems can be reduced via basic amplifier design modifications, concerning e.g. the doping concentration, effective mode area and pump propagation direction. On the other hand, the Brillouin gain can be used for operating a Brillouin fiber laser [5, 10, 18]. Such devices are often made as fiber ring lasers. Due to low resonator loss, they can have a relatively low pump threshold and a very small linewidth. The temperature dependence of the Brillouin shift can be used for temperature and pressure sensing (→ fiber-optic sensors).